A few years ago, I gave a talk about how algorithms and social media shape what we know. 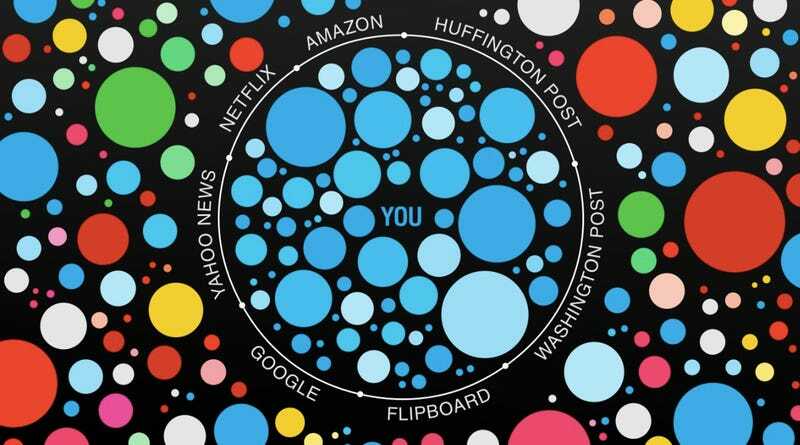 I focused on the dangers of the “filter bubble” — the personalized universe of information that makes it into our feed — and argued that news-filtering algorithms narrow what we know, surrounding us in information that tends to support what we already believe. The image at the top is the main slide. Here’s the upshot: Yes, using Facebook means you’ll tend to see significantly more news that’s popular among people who share your political beliefs. And there is a real and scientifically significant “filter bubble effect” — the Facebook news feed algorithm in particular will tend to amplify news that your political compadres favor. First (“Random”), this shows the total proportion of hard news links on Facebook if everyone saw a random sample of everything. Liberals would see 45% conservative content, and conservatives would see about 40% liberal content. Second (“Potential from network”), you see the average percentage of cross-cutting articles posted by a person’s friends. Third (“Exposed”) is the percentage that they actually saw — this is where the algorithm plays in. And fourth (“Selected”) is the percentage that they actually clicked on. In its press outreach, Facebook has emphasized that “individual choice” matters more than algorithms do — that people’s friend groups and actions to shield themselves from content they don’t agree with are the main culprits in any bubbling that’s going on. I think that’s an overstatement. Certainly, who your friends are matters a lot in social media. But the fact that the algorithm’s narrowing effect is nearly as strong as our own avoidance of views we disagree with suggests that it’s actually a pretty big deal. There’s one other key piece to pull out. The Filter Bubble was really about two concerns: that algorithms would help folks surround themselves with media that supports what they already believe, and that algorithms will tend to down-rank the kind of media that’s most necessary in a democracy — news and information about the most important social topics. While this study focused on the first problem, it also offers some insight into the second, and the data there is concerning. Only 7% of the content folks click on on Facebook is “hard news.” That’s a distressingly small piece of the puzzle. And it suggests that “soft” news may be winning the war for attention on social media — at least for now. The conversation about the effects and ethics of algorithms is incredibly important. After all, they mediate more and more of what we do. They guide an increasing proportion of our choices — where to eat, where to sleep, who to sleep with, and what to read. From Google to Yelp to Facebook, they help shape what we know. That ideological tagging mechanism doesn’t mean what it looks like it means. As the study’s authors would point out — but many people will miss — this isn’t a measure of how partisan-biased the news article or news source is. Rather, it’s a measure of which articles tend to get shared the most by one ideological group or the other. If conservatives like unicorns and there’s content that passes the “hard news” filter about unicorns, that’ll show up as conservative-aligned — even though the state of unicorn discourse in America is not partisan. This only measures the 9% of Facebook users who report their political affiliation. It’s reasonable to assume that they’re a bit different — perhaps more partisan or more activist-y — from the average Facebook reader. Eli Pariser is the author of the New York Times bestseller The Filter Bubble: What the Internet is Hiding From You and the co-founder of Upworthy, a website dedicated to drawing attention to important social topics. He’s at @Elipariser on Twitter. This post originally appeared on Medium and is published here with permission.